Celebrate the season with Disney. 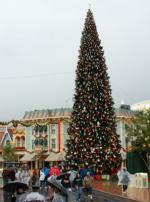 Disneyland at Christmas transforms the Magic Kingdom into a holiday wonderland. The transformation is not as immersive as some theme parks' Halloween celebrations, but all the decorations and seasonal trimmings at the park will help you get into the spirit of the holidays. The holiday changes to Disneyland begin when you enter the park at Main Street USA. Wreaths are placed under the light posts as well as adorning most of the buildings. The festive round balls add color during the day, and they reflect pleasantly at night when the lights come on. The wreaths that hang across Main Street, connecting to the buildings on each side, give the slight impression of walking under a seasonal canopy, leading to a large Christmas tree prominently displayed at the north end of the Main Street circle. It is very tall and expertly decorated, with presents at the base. The other section of Disneyland at Christmas that is most changed is New Orleans Square. It actually looks more impressive at night than Main Street because of the closer proximity of the buildings. If you have visited during the day, make sure you revisit New Orleans at night before leaving the park. Even Snow White's Castle has holiday decorations. 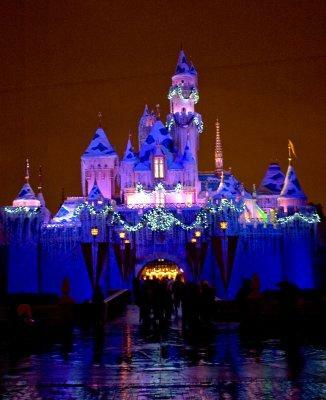 The colors change to a more icy-blue color several times at night, with icicles hanging off the castle. The changes to the castle are most spectacular when the lights change from purple to the icy-blue at the conclusion of the fireworks show. Most of the rides do not have Christmas decorations, but you will see some Christmas-related items for sale in the gift shops. Santa visits the daily parade. The parade through Main Street is usually held twice a day, once in the afternoon and again in the early evening. It starts with a marching band that gets everyone's attention and draws crowds onto Main Street. Next, the honorary Grand Marshal is driven through the parade route. Finally, the crowd gets to see what they came for: Santa Claus! Santa and Mrs. Claus ride in the back of a golf-kart type vehicle. Find a spot close to the road for the nicest view. Following right behind Santa is the bus filled with the Disney characters. The actions of the characters are quite varied. Some are interacting with each other, oblivious to the audience. Other characters, meanwhile, are actively looking for audience members to wave at. In addition to some of the changes to the park, there are also some modifications to a few of the rides, notably It's a Small World and the Haunted Mansion. Small World still features children from around the world during the holidays, but instead of the usual decorations, they are all celebrating Christmas and the winter holidays. You know you are in for a different experience right from the start, as you are greeted with a Happy Holidays sign as you make the first turn into the ride. 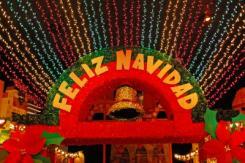 Even if you are not a fan of Small World, the holiday-themed version of the ride is very festive and worth your time. For Christmas, the Haunted Mansion is themed after the movie The Nightmare Before Christmas. The snow scene at the end is very attractive. You could argue that this version of the ride is better than the traditional version. Make sure you visit this ride before leaving. Disney spreads holiday spirit to everyone. Disneyland at Christmas is not complete without a fireworks show. The show has a holiday theme with Christmas music playing in the background. If you are watching from Main Street, it will "snow" at the end of the show (unless it is raining, then the snow is not released). Also, try to have a view of Snow White's Castle so you can see the colors change to the holiday version. Visiting Disneyland at Christmas brings classic Disney magic and the wonder of the holiday season together in a festive blend of lights, decorations, and seasonal cheer. Whether you're a fan of the Disney experience, the wonder of the holidays, or both, visiting this popular theme park during the holidays can be a joyous theme park getaway.